Sessions 17 and 18 will focus on recognizing the different types of turnabouts and selecting the appropriate type of turnabout for a given situation. Review previous lesson objectives. Begin Sessions 17 and 18 in a large, level parking lot free of obstacles. Practice 2-point, 3-point, and U-turns in a parking lot. Progress to a lightly traveled residential area, and practice visual search skills, turns and each turnabout at least 10 times. The easiest and safest way to change directions is to drive around the block. The 2-point turnabout to the right rear is the next best option. Two-point turns require the driver to head into, or back into, a driveway on the same side or on the other side of the roadway to reverse direction. It is safest to execute a 2-point turnabout by backing into a driveway on the same side of the street. Three- or five-point turns are an option if no driveway is available, traffic is light, you cannot drive around the block, or the available space prevents a U-turn. To begin a 3-point turn, pull over next to the curb on the right. When safe, move forward while turning the wheel sharply to the left towards the opposite side of the road. Stop a foot from the curb. Shift to reverse. Check traffic and back slowly, turning the wheel to the right until your front bumper is in the center of the road. Shift to drive and target the center of your path of travel. A 5-point turn is needed on very narrow roads. U-turns are very dangerous because you cross the paths of multiple lanes of traffic, and they are not allowed at all intersections. 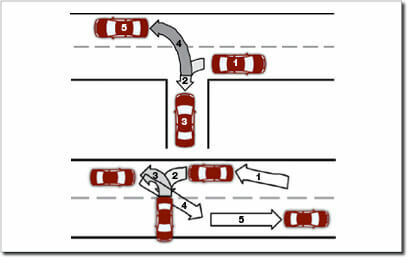 On a two-way multiple-lane highway, the driver begins the U-turn in the left lane closest to the center line or median. The driver completes the turn in the lane furthest to the right in the opposite flow of traffic and accelerates to the appropriate speed. If making the U-turn on a divided highway with a median, stay on the right side of the median.